Brian Moriarty wants to make a LOOM sequel with Wadjet Eye Games!! Re: Brian Moriarty wants to make a LOOM sequel with Wadjet Eye Games!! So we have a hope! To tell the truth, I doubt Telltale could make it now - after Dave Grossman left them and they switched from adventures to interactive stories. And Double Fine seems to have some money problems. So Wadjet Eye is the best bet I think. I agree with you a 100%! Double Fine don't seem to get things done lately – plus they've ruined both their Kickstarter experience (with "Broken Age" still not being done) and their Early Access experience on Steam (by turning the alpha version of "Spacebase DF-9" into the official release overnight without bugfixing or improving it). Aside from the fact that "Broken Age" wasn't even a real point & click adventure game as originally advertised. It was more of a dumbed-down interactive story with laughably easy "puzzles" (if you can call them that) for casual gamers – and with mainly mobile devices as platforms in mind. A shame. While I do enjoy Telltale's games (most of all "Tales of Monkey Island" and "Back to the Future"), I can't help but feel like they are really becoming more of an interactive movie kind of thing – just like QuanticDream's games have over the years. And even when they create genuine point & click adventure games, they still feel kind of repetitive and stale as Telltale continues to just slap new textures onto their existing engine (which still has that awful control scheme that was introduced with "Tales of Monkey Island"). Wadjet Eye Games, however, would be simply PERFECT for the "Loom" sequels! Both Dave and Ben love the game (and I bet Francisco does, too) and... oh MAN... just IMAGINE the breathtakingly gorgeous artwork and animation Ben would make for those games!! "Loom 2: Forge" plus "Loom 3: The Fold" by Wadjet Eye Games... this would be THE best news since the resurrection of Looking Glass Studios in the form of OtherSide Entertainment! Yeah, I've played through that "Forge" game twice and it was really great! I enjoyed every second of it! Kudos on that awesome new control system with the Blacksmiths' gauntlets! It's funny, because I've been talking to press at GDC all week about how I plan to phase out publishing in order to focus more on my own work, and then THIS happens and how can I say no? This is VERY flattering and I'm certainly honored. Loom is naturally one of my all-time favorite games and Wishbringer (another game by Brian Moriarty) is the very first PC game I ever played. I even mention it in my bio on the about page of this site! I'd even go as far as to say that Wishbringer is what set me on the path to what I'm doing now. So I'm definitely interested. I emailed him. We'll see what happens. If I'm at liberty to say anything, rest assured I will! That said, I've been in this situation before. I've been offered awesome licenses in the past only to have nothing come of it, but at least this time the offer was made public so I am at liberty to brag about it on Twitter. Now it makes me want to play loom even more, better get the Lucas arts adventure pack soon I guess. Have you played the dig? I have definitely played the Dig. By the way, it is worth noting that the rights to 'Loom' itself are held by Disney - but as Bobbin and the swans are gone anyway, I don't think it would be necessary to buy them. And the rights to 'Forge' or 'The Fold', those sequels Brian had originally planned, are held by nobody, I believe, as they were not created? So we can still have a proper sequel without mentioning Loom by name. So I just had a nice chat with Brian Moriarty. He told me that he just found out that the legal rights to Loom are really tangled up. It's complex and mysterious but essentially it would be too much effort for a little company like mine to unravel. So Loom 2 won't happen. At least not by us. We still haven't ruled out the possibility of a collaboration though. So Loom 2 won't happen. That's sad to hear But yes, it was logical to predict that. Although I do believe that the possible cooperation between Brian Moriarty and Wadjet Eye Games could still bring us some more masterpieces. I was there for his talk and hearing him speak was a great experience, and meeting him afterwards and having a chat (where I found out he's played A Golden Wake as well as the other Wadjet Eye games) was incredible. I love Loom. It was the first LucasArts game I played. Working with Brian Moriarty would be amazing, so let's keep our fingers crossed that something comes out of this. I doubt a kickstarter could help - Disney is too large company to bother itself with such things, and even Ron Gilbert did not try to buy back his rights to Monkey Island (which is more popular game than Loom). To all of you that are Lucas Arts fans, you can purchase the Lucas Arts adventure pack (The Dig, Loom, Indiana Jones Fate of Atlantis & Indiana Jones The Last Crusade) for $9.99 on Steam. I am a big fan of Wadjet Eye's adventure games, but I registered in the forum just now, just because of this (exciting) topic. It's a bit of a shame that Wadjet Eye Games won't be able to get the IP sorted out for a sequel, because I think that this company out of the three that Brian Moriarty mentioned, is the most ideal one for a Loom 2 / Forge game. However, I am still excited at the possibility that there might be a another project in cooperation with Brian Moriarty. About this. 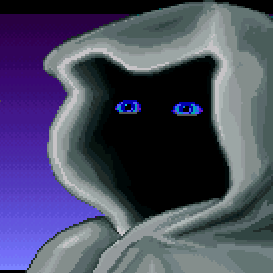 The only good thing that the Steam version (which is the CD Talkie version) of LOOM has going for it, is the voice acting. It has however some severe cuts in the dialogues, removed some closeup scenes, added some awful exaggerated animations and made a few other changes to the story and characters. It is not the best version of the game. If you can get the FM Towns one or the original EGA one, those would be the versions to play. I think for a while there was a way to get the FM Towns version if you could prove that you owned the Steam one, but I am not sure if it was 100% legal or if that service is still up (I never used it).